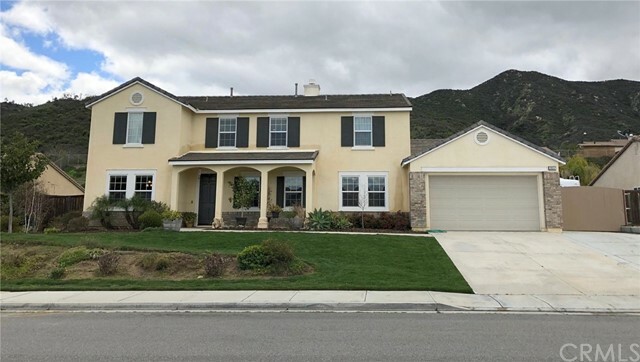 All Wildomar homes currently listed for sale in Wildomar as of 04/18/2019 are shown below. You can change the search criteria at any time by pressing the 'Change Search' button below. 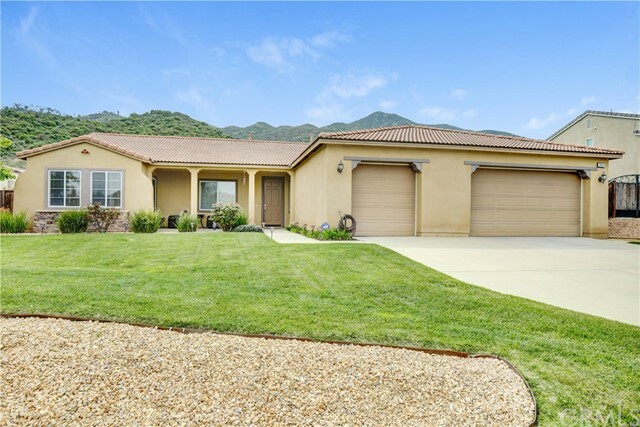 If you have any questions or you would like more information about any Wildomar homes for sale or other Wildomar real estate, please contact us and one of our knowledgeable Wildomar REALTORS® would be pleased to assist you. "LOCATION LOCATION!!!! 21.3 fenced acres in the path of progress on busy road. Perfect for storage facility. Easy access and 1,130 Ft of street frontage offer great company visibility. Bundy Canyon RD connects the 15 and the 215 freeways along with the 79 N highway making it very centrally located. property has small older buildings in center that should offer electricity and a well for water. 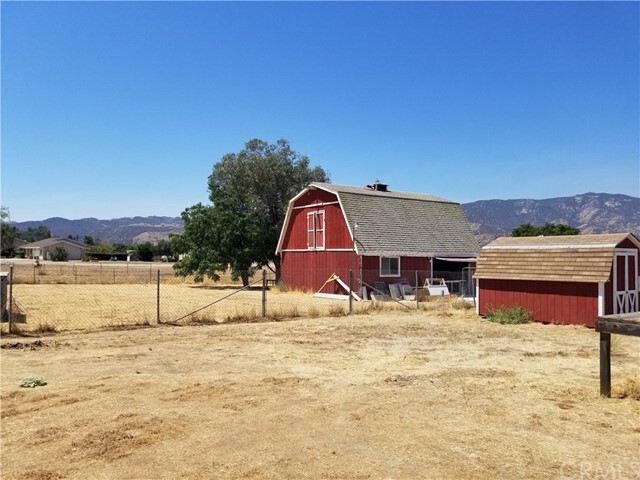 Property is about 2 miles west from upcoming shopping center which includes (Walmart, Subway, Yellow Basket and more...), Located about 2 miles from High school and about 3 miles from Lake Elsinore and 4 miles from Menifee. Great Opportunity!! BUYER must check with city of Wildomar for all uses. Call the Planning Department. BUNDY CANYON ROAD WILL BE WIDENS TO 4 WAY AND CENTER LINE ROAD, IN THE FUTURE OFFERING SIGNIFICANT OPPORTUNITIES. HUGE BUNDY CANYON ROAD FRONTAGE AND OVER 90% USABLE. EXCELLENT INVESTMENT FOR FUTURE DEVELOPMENT!" "For the equestrian enthusiast. This beautiful turnkey ranch sitting on 6 acres consists of 3 MD barns totaling in 14 matted box stalls, seven are 12 x 16, seven are 12 x 12, with 2 indoor grooming bays and 3 tack rooms. All barns have automatic fly spray systems. In addition, there is an outside 3 horse grooming bay/wash rack, a 2 sided covered hay barn that can hold 28 tons. 4-horse hot walker with a perimeter fence, 7 ton grain silo, palpation chute/breeding area, and a 50' round pen. Also, there are fourteen 32 x 24 paddocks with 12 x 12 shelters, seven 24 x 48 paddocks with shelters, two 48 x 48 paddocks, and two 24 x 24 welded wire stallion pens (one with shelter). Three approximately 1 acre pastures, with an arena that is approximately 1 acre in size, 24 x 48 preview arena. Property is fully irrigated by well. Home and horses are all on district water. Property has solar to offset electricity and is fully fenced with non-climb horse fencing. Plenty of outside parking for RV's, toys and horse trailers. 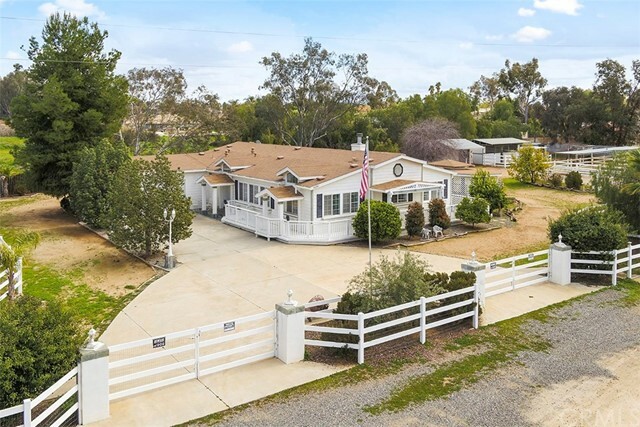 This established income producing horse facility comes with a beautiful open floor plan home with 3 bedrooms and 2 baths with an attached 3 car garage. Stunning distressed hardwood floors throughout, double-pane windows, travertine tile in the bathrooms, crown molding and a double sided gas fireplace for ambiance. The backyard consists of a privately fenced grass area with a covered patio and in-ground swimming pool for entertaining. Property can be subdivided." 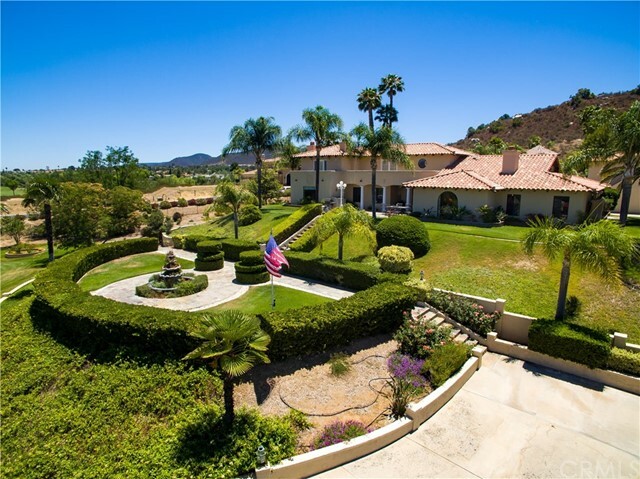 "Your client won t want to miss out on this secluded, Mediterranean-style estate home overlooking Bear Creek Country Club golf course with fabulous views of the surrounding foothills. On just under four acres of land, this property has endless potential. Resort-style pool with soothing waterfall as well as rose-lined walking path are some of the more relaxing outdoor features of this estate. The house itself is 5,874 square feet with an additional estimated 1,100 square feet of living quarters above the three-car garage. The main house has wood, vaulted open beam ceilings in the formal living room and breakfast nook; hand-painted murals depicting pastoral scenes throughout; two separate, large master suites on each level with walk-in closets; very private grounds with gated entry; and one of the largest lots in the neighborhood. Country living with city amenities just minutes away!" "The gem is a gated family compound that is secluded, yet close to it all. 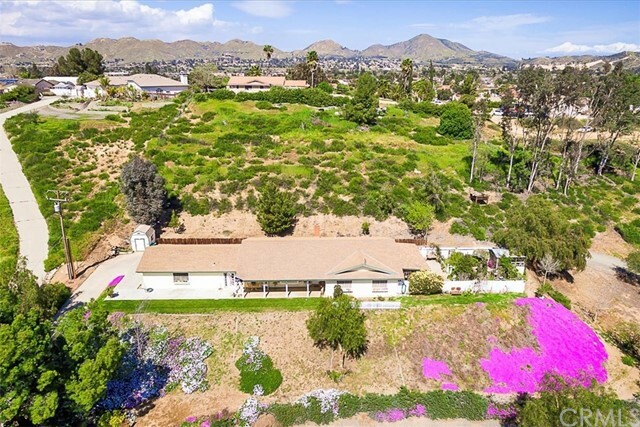 Set between Corona and Temecula this property is close to the 15 freeway and a short drive over the Ortega Mountain (via Highway 74) to the beach. Built in the 20's and rebuilt in the 80's this home has old world charm with new world amenities. Once through the gated entry you're greeted with the charm and character rarely found in this area. The property is set up with basketball court, pool and spa, detached 6 car garage, and this beautiful home overlooking it all. The home has 4 bedrooms with one down, two family rooms, formal dining rooms, kitchen with breakfast nook, basement/shop, and master suite. 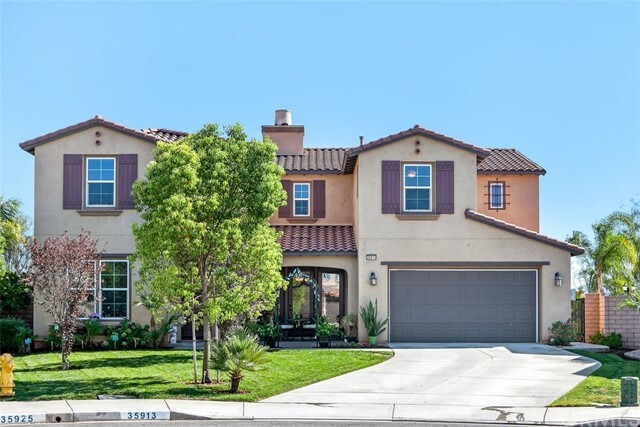 The kitchen opens to a patio over looking the pool and basketball court so you can enjoy watching the kids play or look out in the distance and see the skydivers flying over Lake Elsinore. This truly is a compound perfect for any family, as that is what it has been for the current owner." "This is a great home situated on 2.68 acres, a awesome neighborhood, Great views close to freeway shopping and restaurants. The home has 4 bedrooms and 3 baths, the home is 2768 square feet, It has 2 master suits. Granite counter tops in the kitchen and baths and laundry room, travertine floors, custom Lighting fixtures inside and out. Stainless steal appliances, custom paint 8' high solid doors with oil rubbed hardware, crown molding though out with 10' ceilings, with a water conditioning for the hole house. Vinyl three rail fences with 2x4 five foot wire behind fence. It also has a 4 car garage, a four stall breezeway barn 2 24x24 turnout pens with shade cover, 120x220 arena. 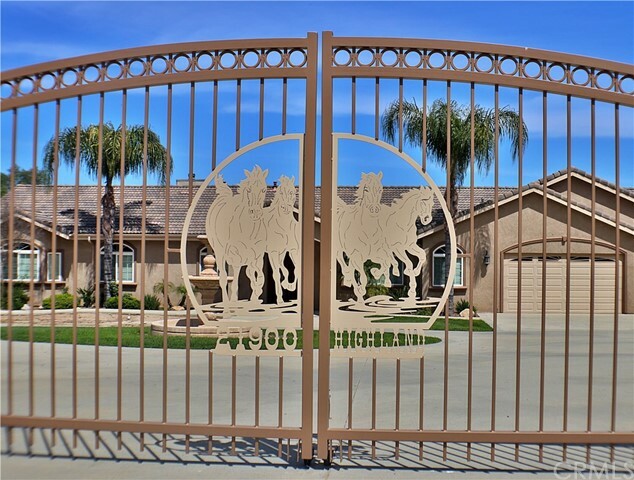 wash rack, Gated with custom rod iron gates with keyless opener form the key pad or a phone, property is all setup for a horse enthusiast. Please call for gate code and showing. Seller is a licensed Real-estate agent. And seller is motivated." 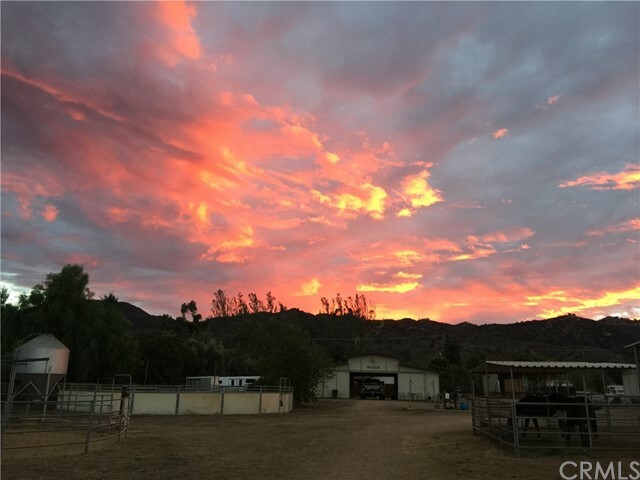 "Your Own Private Ranch for Horses, Toys, Trucks, Motorhome, Equipment, Room for all of it at this 6.17 Acre Move in Ready Property. Country Living in the Middle of Town, across the street up just a little from the Exclusive community of Bear Creek and next to Million-dollar homes is this Country Jewel. 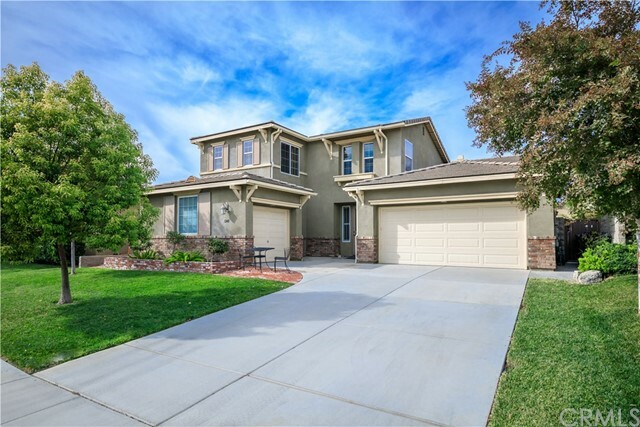 Gated and down a long private drive is this Single-Story charmer with 2627 sq ft it has 4 bedrooms and 2.5 baths, and a Large area Fenced that has a heated Pool and Spa party deck with Fire pit for loads of family fun. Large open Kitchen that opens into the oversized Family Room with Fire Place. This Kitchen has granite counters and newer appliances, and the home has just been painted and new carpet installed in all the bedrooms. Beautiful Views and Privacy on City Water and So Cal Natural Gas, Come take a look you will not be disappointed." "This is the completely turnkey Horse property for which you've been searching. 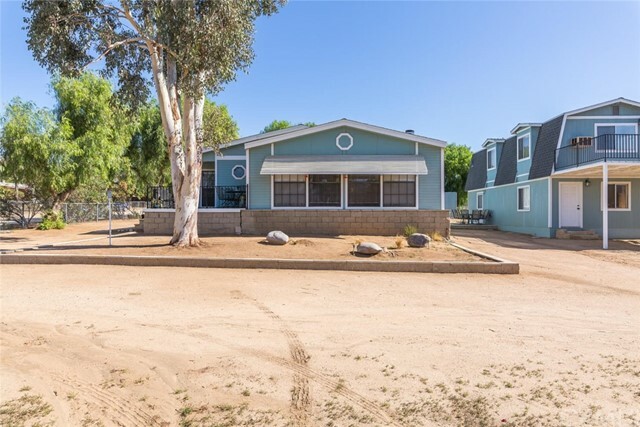 This 2800 square foot, 3 bedrooms, 3 bathrooms, ranch style home built in 2003 is located on a fully fenced and gated 1 acre lot which is flat and completely usable. Bring your horses and all your livestock as this property is built out to accommodate them with 2 Horse Stalls, a Barn, a separate Tack and Feed room, a 60X100 ft lighted and irrigated Arena, 3 Covered Pastures, a Grooming facility with water and power, 2 chicken coops, an Aviary, and two additional structures for goats, pigs or mini horses. The driveway provides parking for up to 5-6 cars, plus an oversized 24X24 2 car garage with satisfy all of your parking needs. There is plenty of room for at least 1 RV to be parked and possibly 2, and lots of room for all of your toys. The moment you walk through the front door, you will know you've found a special home. The vaulted ceilings open floor plan, the abundance of windows and bright light, the travertine accented walls and columns, and the entertainers kitchen open to the family room will remind you about how special this home is. The kitchen and all three bathrooms have granite countertops, custom cabinetry, and tile flooring. The amazing living areas flow nicely to the outdoor areas through beautiful French doors to access the wrap around covered patio and outdoor entertaining areas. Com quick, this one will go fast. Call now for your private showing." "Better than the Models! Fully Upgraded, Landscaped and Hardscaped w/ SOLAR owned FREE & CLEAR! Generation is approximately $200 net positive at end of year! FREE Electricity! Light & Bright Open Floorplan with Designer Colors this wonderful home features Chic features throughout. Upon entering the home, you are welcomed by a large sitting room that opens wide to the California Patio Room. The Gourmet Kitchen features Stainless Steel Appliances, Large Granite Center Island, Opens Nicely to the Oversized Family Room w/ Warm & Cozy Fireplace. Ideal for Entertaining this home features a California Patio with a Ceiling fan and recessed lighting has stamped concrete that Leads to a State of the Art Spa and a Custom Built BBQ Island. Plenty of land that provides for Organic farming or expanded patio space. There's an Office and Main floor Bedroom Suite for inlaws or guests. The home has the upgraded Central Vac System throughout, fully security monitoring system and video cameras and doorbell already set up, which you can connect via app. Upstairs features , Plush Upgraded Berber Carpet, a Large Bonus Loft Area next to the Large Master Suite with Walk In Closet. All Bedrooms are generous in size and offers alot of flexibility. 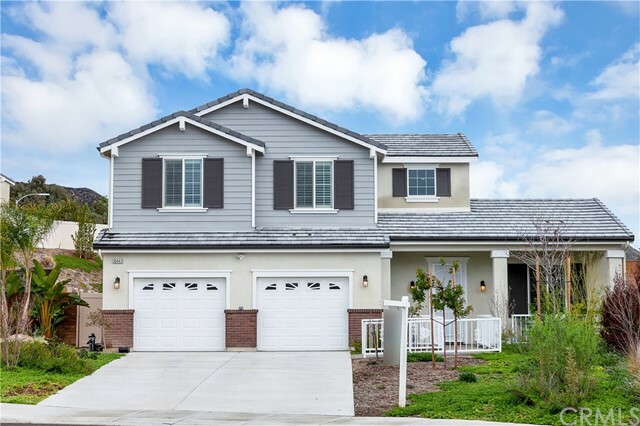 With the Free and Clear Solar, Fully Landscaped Backyard, and Upgraded Contemporary Interior Make this one of the Best Homes on the Market, See this Today!" "Live the Country Life in Town! This Ranch Style 3 bedroom/2 bath 1949sf home is on 4.80 acre. The Home is Turn Key. Upon entering you will love the Open Floor Plan with Wood Beam Ceilings, Hardwood Floors, Gorgeous Brick Fireplace, Bay Window with Incredible Views, City Lights, Majestic Mountains. There is a Kitchen Island over-looking the Great Room, Tile Counters, Stainless Steel Appliances. Enclosed Breezeway makes it nice to walk in from the 2 car Garage. The Spacious Master has a large walk in closet and features a Claw Foot Soaking Tub, French Doors lead to your own Private Patio and Secret Garden with a Charming Potting Shed Full of Windows. This property is Beautifully Landscaped with drip irrigation and many Mature Trees, Electric Gate Entry. Perfect for Horses, Events (Weddings), RV Storage (plans drawn). Close to shopping/freeway access. No HOA and Low tax!!" "Undoubtably the nicest home in the community. This former model is loaded with extensive upgrades such as crown molding and wainscoting, custom built-Ins, zoned music, plantation shutters, stainless steel appliances with granite counters, custom tile work, wood flooring and new carpet. Outside relax with a full length covered patio with fans, crystal pool and spa with a gas fire pit. Enjoy all of this with low utility bills due to the efficiency of the home." "LOCATION! LOCATION! LOCATION! CORNER LOT ON BUNDY CANYON & ORCHARD ST. LOT SIZE IS 1.44 ACRES, IN BUSY TRAFFIC AREA AND CITY SHOW ZONING FOR COMMERCIALIZED. PROPERTY LOCATED NEAR FREEWAY AND MANY BUSINESSES ON BUNDY CANYON INCLUDING A GAS STATION, A NEW SMALL MULTI UNITE COMMERCIAL BUILDING THAT WAS JUST COMPLETED NEXT TO JACK IN THE BOX DOWN THE STREET. ALSO NEXT TO ELSINORE HIGH SCHOOL. FLAT LOT IDEAL FOR COMMERCIAL BUILDING. BUILDER AND INVESTORS - GREAT LOCATION TO BUILD A RESTAURANT BUSINESS, AUTO REPAIR SHOP, DRUG STORE, BANK... & MUCH MORE. SALE IS LAND VALUE. ZONING CHANGED TO COMMUNITY COMMERCIAL ZONE FOR PROPERTIES ON THIS STREET. 2 BEDROOM, 2 BATH MOBILE HOME CAN BE USE FOR OFFICE, A HUGE BARN & OVER SIZED 2 CAR DETACHED GARAGE WITH PERMIT ON PROPERTY. SELLING IN AS IS CONDITION. PLEASE DO NOT DISTURB OCCUPANTS. PLEASE FEEL FREE TO DRIVE BY OR FOR SHOWING CALL L.A. CITY OF WILDOMAR, BECAME AS CITY IN JULY 2008, SINCE THEN THERE HAVE BEEN A LOT OF CHANGES MADE. ALSO CITY ALLOWS MORE BUSINESSES TO BE BUILT AND BRINGING MORE JOBS & PEOPLE WITH NEEDS. THIS PROPERTY IS LOCATED IN THE MIDDLE OF THE CITY WHERE LOTS OF DEVELOPMENT IS CURRENTLY ON ITS WAY." "Welcome to Creekside at the Ranch! 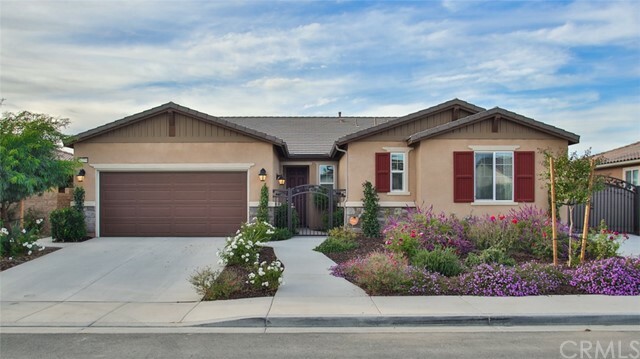 This newly built neighborhood of all single story homes are located on the south end of Wildomar. ***Compares to the Models*** Step inside this highly upgraded home, almost just too many to list. No expense has been spared in this pristine home with large RV Access (approx. 12x80). Enter this lovely 4 bedroom home featuring all wood floors throughout, 8 foot interior doors, custom 7 inch baseboards, elegant crown molding, custom draperies, Ceiling fans, state of the art Security System. The modern gourmet kitchen features Theramador appliances with 5 burner cooktop, expanded Island with extra storage, Exquisite Quartzite counters, Farmhouse sink, cabinets equipped with pull out draws for easy access, not one but two Pantries. The master suite features oversized walk in closet, master bath has double sinks and upgraded custom shower enclosure. The backyard is professionally landscaped with drip system, beautiful flowering vegetation, a tranquil fountain, and huge Alumawood patio cover with ceiling fans that stretches the entire length of the home giving plenty of space for outdoor living and entertaining. 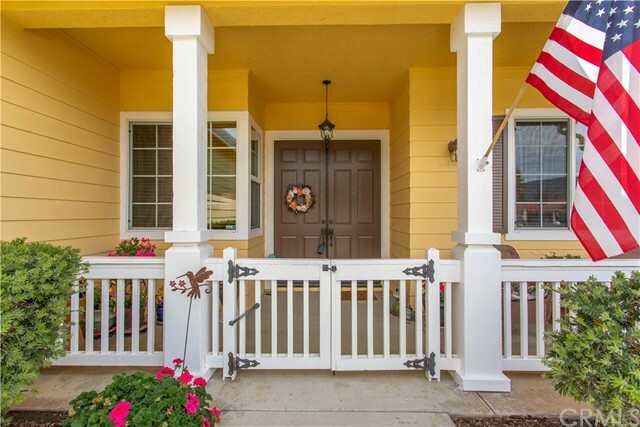 This home features RV Access gated with custom rod iron. Professioanlly landscaped front yard on water efficient drip system and more colorful vegetation . 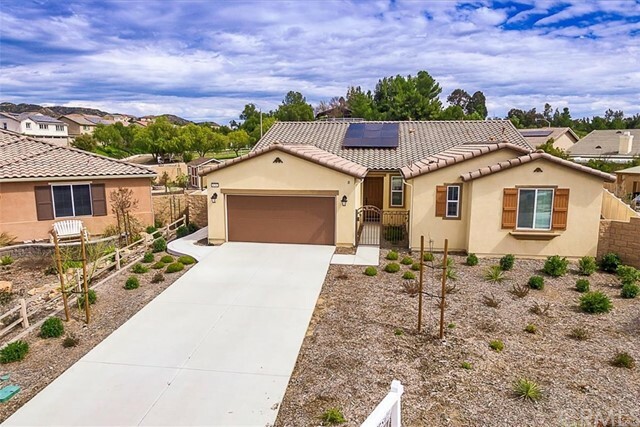 Quick & Easy FWY access, close to schools, shopping, the Santa Rosa Plateau Ecological Reserve is just minutes away and just a short distance to Temecula Wine Country and Old Town." "YOUR ATTENTION PLEASE! The search has ended! This is no ordinary home; as a matter of fact The Ranches may be the best kept secret in town. Come tour this spacious single story home on a generous plot of land that harkens back to the comfortable times of good old fashioned country living, with an abundance of modern convenience. Enter through a neighborly front porch to a massive, inviting living and formal dining room that scream hello, sit down and relax awhile. Large kitchen and great room/family room with fireplace adjoins. This home offers large bedrooms each with their own bathroom, and a master suite that is the size of Texas (not actually measured by agent, but best guestimate). A full fourth bathroom, den/office interior laundry room, large walk in closets, extra storage closets, granite counters, and if not enough, 3 ways to exit to your spacious just under acre back yard from any of the back facing rooms; family, living, and master. RV access available with hook ups. Horse property. Large attached 3 car garage. Front and back yard has lush manicured landscaping. Bring the wife, kids, critters, and toys. There is room for all to roam. Opportunity is knocking and this home demands attention. Check out attached supplements for floor plan and detailed amenities." "Gorgeous home located on a quiet culdesac within the highly sought after Woodmoor Community. This home has numerous upgrades and amazing privacy. 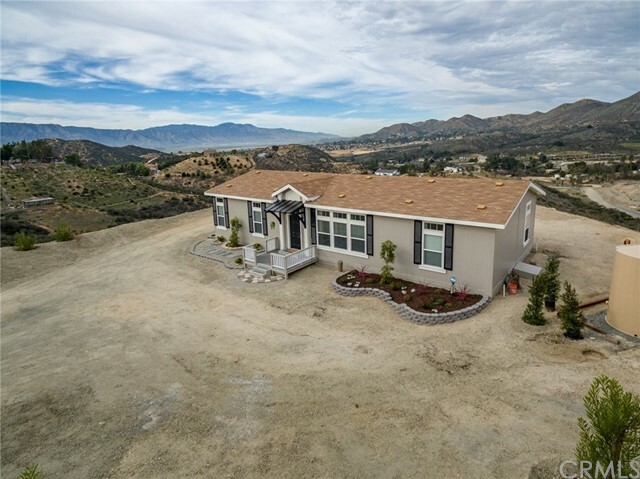 Located on a half acre with beautiful views of the hills to the rear of the home and distant city lights to the front. 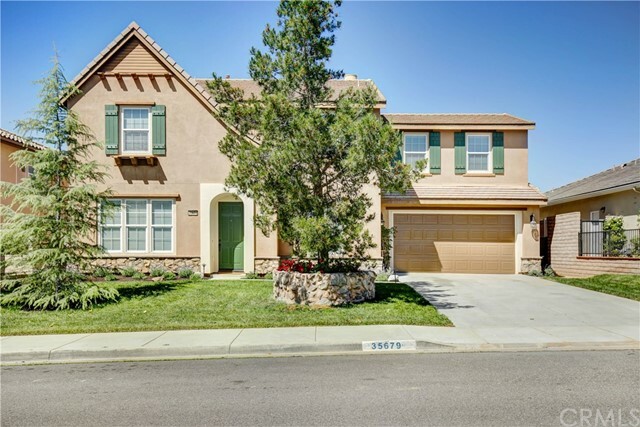 This special home includes 3,919 sqft and has 4 spacious bedrooms and 3-1/4 bathrooms. This includes a private bedroom and 3/4 bathroom downstairs plus a separate powder room. There is a large bonus room located upstairs with a built in entertainment center and an office off the master bedroom with built in bookcases. If more bedrooms are needed the builder had an option to convert part of the oversized 4 car garage and/or one bedroom and bathroom can take the place of the bonus room upstairs. This would potentially add another two bedrooms and one bathroom to the already large family home. The many upgrades include:hardwood flooring with tile accents, wrought iron staircase railing, custom wainscoting, window and door framing, ceiling fans, custom lighting on dimer switches, custom built in cabinets, two fireplaces, RV parking with sewer hookup and water, beautiful custom swimming pool and spa with stamped/colored concrete. 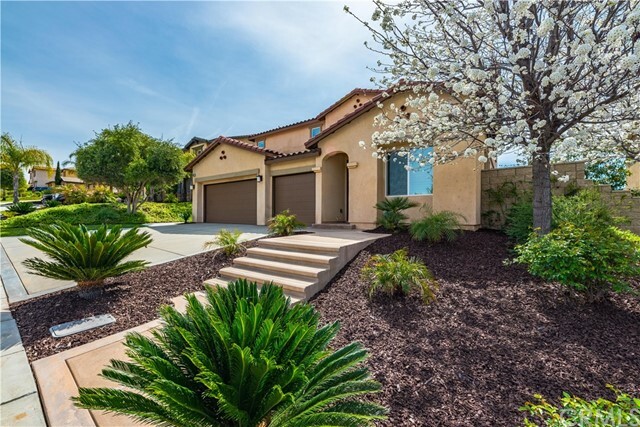 Close to many amenities in the growing community of Wildomar and surrounding area. Easy 15 Freeway and Ortega Hwy access for commuters. Lots to do in the surrounding area with the Temecula Wine Country or Pechanga Casino only a short 25 minute drive away." "Price reduction SELLER MOTIVATED!!! Welcome to Creekside at the Ranch! COMPLETELY UPGRADED THROUGHOUT! You ll fall in love with this highly desirable 3000+ sf Julia floorplan with covered porch entry, large great room with fireplace, surround sound speakers with wired network and double sliding doors leading to patio! Modern gourmet kitchen has a HUGH Island, five burner cooktop and double ovens, upgraded stainless steel appliances, granite countertops and over-sized walk in pantry. There's even a Butlers Kitchen and extra counter space for entertaining!! Flex space off kitchen has built In custom desk area with wired network drop, great for a home office! Separate formal dining room has extended glass sliding doors leading to covered courtyard. Four spacious bedrooms, three bathrooms that include upgrade countertops and upgraded shower in master bath. You'll love the laminate plank flooring throughout, 8 foot interior doors, upgraded cabinets and extra storage space in the laundry room! 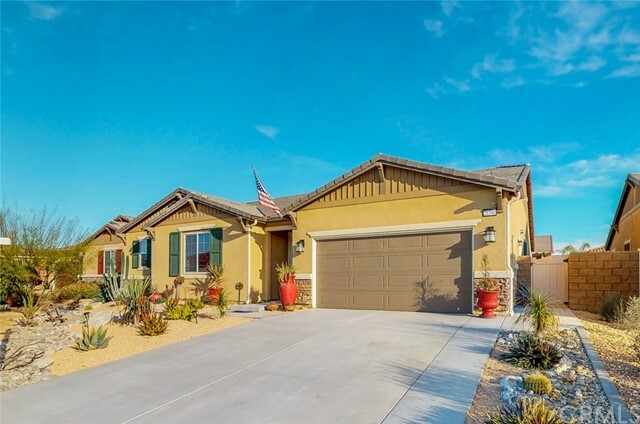 The exterior landscaping and hardscaping have been customized with drought tolerant/low maintenance landscaping, covered patio with aluma-wood cover included ceiling fans, HUGE builtin BBQ island, gas fire-pit and mini retaining walls with drip systems. Energy Efficient Home! Too much to mention!" "This 2017 Richmond American Home, has the new home charm & so much to offer. The front yard features all water wise plants & sprinklers. Property is fenced. Enter this unique upgraded home through an Ornate Wrought Iron Gate into the 9' front door. Pergo laminate flooring throughout, carpet in all bedrooms. There is a Large Dining Room with upgraded cabinets & glass inserted doors next to a Butler's Pantry with space for wine frig. Walk into the Great Room with a Fireplace. Then only Steps into your Gourmet Chef's Kitchen with stainless steel double oven, dishwasher & counter top range. There is a Large Island with Granite counters & upgraded cabinets that are self closing. Lrge. Master Bedroom & Bathroom with Dual sinks, stand alone shower, commode, walk-in closet & decorative inlayed Tile flooring. There are two good size bedrooms with walk in closets. The second full bath has dual sinks & there is another half bath both have decorative inlay tile. Large Tiled laundry Rm with all hook ups. There is an office or possibly a 4th Bedroom. Slider to covered patio, access the large back yard, sufficient for a pool, spa, BBQ & children's play area.Yard is fully sprinkled with it's fruit trees, sand stone, river rock, and two areas with artificial grass, & a unique walk way. This is truly a Tropical Paradise. 2 car garage w/tankless water heater. Still want more, LED lighting throughout, solar panels owned, window coverings throughout. Close to all services & quiet neighborhood." "This House Has It All Paid Solar, State Of The Art Wired For Incredible Audio Surround Sound System, 5 Large Bedrooms, Gorgeous Wood Like Upgraded Tile Throughout The House, Plantation Shutters. The Kitchen is A Chefs Dream Extended Kitchen Island With Beautiful Granite Counter-Tops, All High Efficient Appliances, Delicious Up-Graded Cabinets Throughout The House, Special Lighting All Energy Efficient Bulbs, Double Oven Six Burners, Walk-In-Pantry Open Floor Plan . 2 Large Bedrooms Down Stairs With Full Shower Bath Between Them, A Powder Room, At The Entrance A Formal Receiving Living Room, Crown Molding Through Most of The House Fan Lights In Every Bedroom and Family Room. To The Family Room And Amazing Super Large Dinning Room, Simply Welcoming For Large Family. Up Stairs Cozy Loft , Two Large Bedrooms Connecting to A Jack-N-Jill Bathroom For Privacy, Laundry Room is Large With Upgraded Cabinets For Extra Storage, The Master Sweet Is Large Enough To Add A Fire Place It Offers Private Views To The Mountains An Upgraded Walk-In-Closet By Closet Masters... Master Bathroom Double Sink Special Lighting and A Separate Section For Make-Up. The Back Yard Is Design to Entertain And Have Little Ones Play At The State Of The Art Sand Box Play Ground. Cover Patio Fan lighting and Surround Sound, Large Upgraded Shed With Electricity Special Paving Around The House. Special Upgraded Underground Irrigation Back Yard and Front Yard. Privacy Sits on A Cul-De-Sac Over $150,000 In Upgrades." "Beautiful very well maintain manufactured home with pride of ownership! This home sits on 2,244 SqFt of living space with 2 bedrooms, (can easily be converted into a 4 bedroom) 2 baths, with just under 1 1/4 acre that can be subdivided into two parcels for a future return on investment. This home comes with a large kitchen with tons of counter space, lot's of cabinet space and an awesome custom pantry for the best cooks out there. This home also comes with a large laundry room/utility room with large sink, cabinet space for storage and lots of counter space. The living room is very inviting with a fireplace, huge wet bar that opens up to the formal dining room making this great for entertaining with great friends. This property has been very well maintained with a new roofs, tankless water heater, 5 ton HVAC system, fully fenced yard, outside watering system with drip lines, Mature tree s and large fenced kennel. Property is also suitable for horses and comes with a permitted two-story barn with 1,297 Sq ft of workspace/storage space, great for a small business owner/contractor looking to grow their business without the extra overhead." "STUNNING 5 Bedroom, 3 Bathroom Mediterranean Style Home!!! This home has it all! Custom entry with inlaid slate steps, lighted pillars, Planters and Stamped Concrete welcome you home. Custom Travertine Floors, Custom Stacked Stone Fireplace with 100 Year old Wooden Mantle and Stacked Stone Accent Wall, Wrought Iron Banister with Cherry Wood Rails, Granite Counters in the kitchen with a 7'x4' Granite Island, Stainless Steel Appliances, Double Ovens/Convection Oven, New Garbage Disposal, Large Double Door Pantry, Custom Edison Light Fixture over Island, 1 Bedroom and 1 Full Bathroom Downstairs, Oversized Upstairs Loft Area, 3 Large Bedrooms with Walk in Closets, Extra Large Master Suite with Deep Luxurious Soaking Tub and His and Hers walk in Closets, Master also has a Balcony overlooking the Park Like Backyard and the Preserve located behind the home. Upstairs Laundry Room with Large Utility Sink, Washer and Dryer stay with the Home. The Back Yard has been transformed into a relaxing, resort like Oasis complete with custom patios and sitting areas. Upper Circular patio has a gas firepit. BBQ area has a 10FT Stone and cement bar area with under counter storage/sink/gas./electric hook ups. Too many upgrades to Mention. Come on by and see this Stunning Oasis for yourself. I Dare you not to fall in Love!" "PRICE REDUCTION - This gorgeous home boasts approximately 3,507 sq/ft of living space. Upon entering the home you find the formal living area to your left and a formal dining area to your right which is currently being used as a billiard room. The kitchen is open and bright with plenty of beautiful granite countertops with an abundance of cabinet space. Enjoy your evenings in the family room with a cozy fireplace. The main floor of the home has a convenient guest bedroom with a private bathroom. Upstairs is an oversized private office that could easily be converted to a 6th bedroom if needed. The master bedroom has beautiful mountain views. The master bathroom has an oversized soaking tub and a separate shower as well as a very large walk-in closet. Down the hall is a desk work space and three more secondary bedrooms, all with walk-in closets, as well as two additional bathrooms. The separate laundry area is located upstairs for your convenience and includes a sink, counter, and plenty of cabinets. 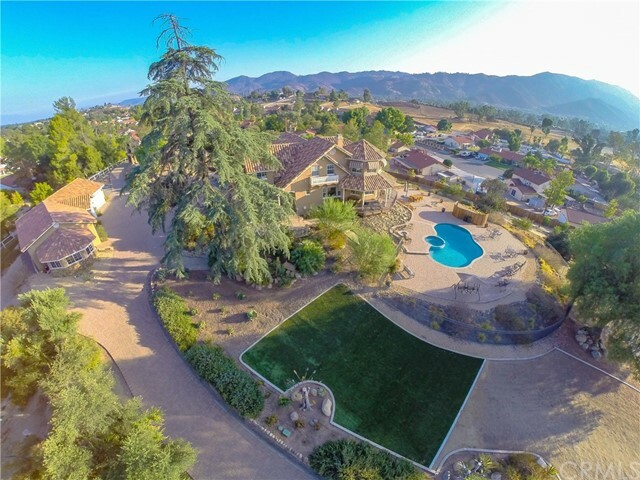 The backyard is extra roomy with a lot nearly 11,000 sq/ft. Patio has stamped concrete with an Alumawood cover. The lush landscaping includes a lot of greenery and even a gazebo for your outdoor pleasure. Sprinkler valves are about one year new. Solar is also included to make warm summer temperatures more comfortable and affordable. Brand new flooring throughout the home. Enjoy the simple amenities the HOA has to offer in this country home setting." "Stunning 4,000 Sq. Ft. House, Owners Pride, Move In Ready. Offering 5 Bedrooms, 4.5 Bathrooms, Large 4 Car Tandem Garage. Main Floor Bedroom, Full Bath and A Guest Powder Room Downstairs. Upgraded Wood Tile Flooring and Carpet, That Opens To The Formal Living Room And Formal Dining Room. Kitchen Is A Chef's Dream, Large Granite Island, A Brand New Over Size Stainless Steel Sink, Breakfast Nook, Serving Station And Pantry. Kitchen Opens To The Grand Family Room, And A Beautiful Fireplace Creating A Cozy Atmosphere For Large Gatherings. Second Floor Offers Master Suite With A Large Walk In Closet, Double Sinks, Shower And Bath Tub. Luxury Vinyl Blinds, Two Bedrooms Connecting A Jack and Jill Bathroom, A 5th Bedroom up Stairs with A Walk-in-closet. Plus A tremendously Large Loft And Wonderful Views From The Bedrooms Up Stairs. Let's Talk About The Back Yard. The Seller's #1 Goal Was To Create A Completely Healthy, Edible and Organic Pesticide Free Garden. Planter Walls Wide Enough To Serve As Seats As Well As Sitting Areas For Socializing And Enjoying The Lovely Surroundings. Perfect For Entertaining Or Just Simply Reading A Book. Mission Accomplished! Offering 17 Trees, From 2 Meyer Lemons, 1 peach, 1 Satsuma Tangerine, Pomegranate And A Multi-Fruit Salad Tree. Strawberries And Herbs Like Greek Oregano, German Thyme, Lavender, Greek Sage And Rosemary. Peaceful Setting With Delicious Aromas, And So Much More. A Must See!" "Don t miss this beautiful single story home with a three car garage located in the City of Wildomar! Nestled at the base of poppy-covered hills is this desirable half acre corner lot, located on a cul-de-sac! A front porch welcomes your guests to your new home, perfect for decorating or sitting and enjoying a relaxing evening. 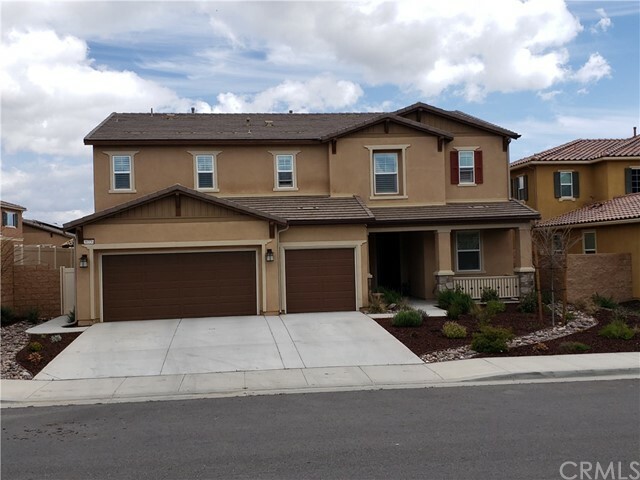 When you enter you will find a formal living and dining room, family room, and a huge kitchen with granite counters and plenty of storage, double ovens and separate cooktop, huge island, and a walk-in pantry. Informal eating area has a slider that opens onto your front porch. Four bedrooms, two full baths, and a half bath for guests. Master and secondary baths have dual sinks, and the laundry room has a soaking sink. Huge backyard open for possibilities!" "REDUCED! BRING OFFER!Welcome to this 5 bedroom, beautiful salt water pool home. An open floor plan with 10 foot high ceilings invite's you in along with easy maintenance hardwood floor's throughout. Formal dining room is perfect for entertaining & opens out to the back yard with lovely french doors and beveled glass. Shutter's throughout & a fireplace in the family room create a cozy feeling. Large windows provide natural lighting, upgraded crown molding. Kitchen displays granite counter tops and back-splash. Large walk in pantry and slide out cabinets complete perfection. Double oven is ready for all your holiday festivities. Main floor Master bedroom along w/ 2 other rooms makes this home perfect in every way. Over-sized Master bedroom allows you to access the back yard directly with french doors! Large bathroom and walk in closet w/built in organizers and hampers. Main floor bedrooms have Jack-n-Jill bathroom. Loft upstairs is just right for the kids! 2 additional rooms/full bath upstairs. 3 fountain pool invites all to relax along w/a built in BBQ/Fridge. Covered patio w/3 beautiful fans & drop shades! Special lighting throughout the back yard. Solar for pool and home. Dog run! Fruit tree's; pomegranate & apricot. Never replace your fence as it's BRICK! Windows pre-wired for alarms. Cul-de-sac. Smart house controls temperatures from 1 single remote. Plenty of storage space, laundry rm w/sink & cabinets, 2 car garage w/1 car tandem/epoxied. Ready to move now! Motivated!" 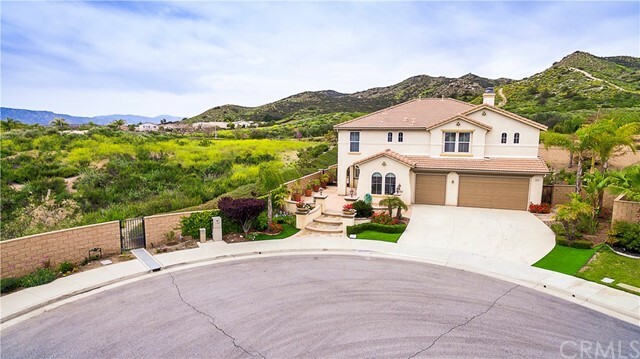 "Views, Views, Views, Every direction you look is Breathtaking, You can see Lake Elsinore, while checking out The Sunset, or look the Other way, and It s Huge Snow Covered Mountains!! 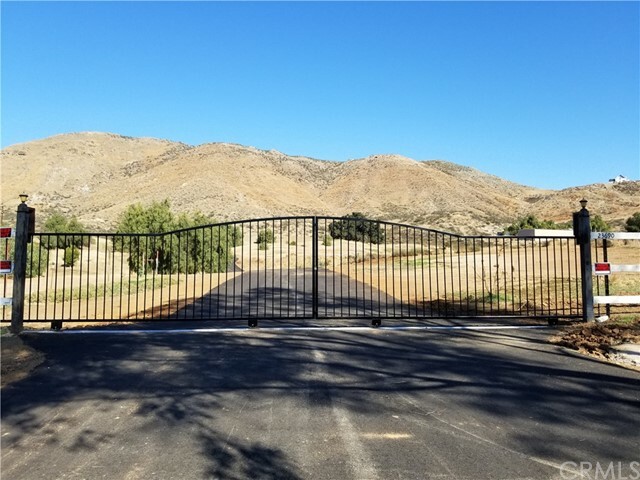 Come out and see this Beautiful, Three Plus Acres, of Horse Property in Wildomar. The property hosts a Brand New Double Wide Manufactured Home on a Permanent Foundation. The Kitchen Has an Amazing View, and All Brand New, with a Commercial Type Propane Range, a Walk-in Pantry, and a Very Large Island That the Whole Family can Gather around, The Floor plan is Wide Open, with the Kitchen, Large Family/Living Room, and Dining Room all open to each other, which makes this Home feel Much larger. The Home also has 3 Three Spacious Bedrooms, all with Walk-in closets. The Master Bedroom is Privately located on it s own side of the House, it has a Large On-suite Bathroom, with Double Sinks, and a Large Custom Tiled Shower. Add to that an indoor Laundry room, Large enough to also Double as a Mud room with it s own door to the outside, and you have it all!!"